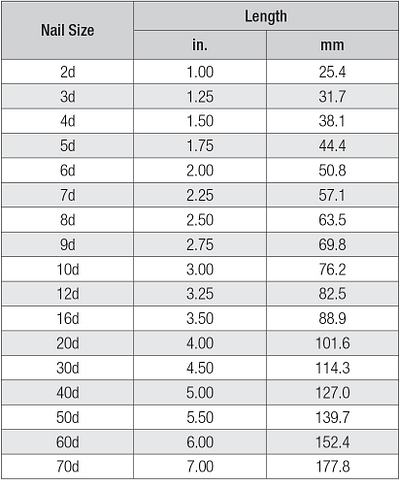 The most common method used to represent nail sizes is the penny size, which is a length designation. The size is written with a number and the abbreviation "d" for "denarius" which is Latin for "penny." While referring to penny size and type designations such as "box" or "common" is a typical method for calling out nails, it is more accurate and reduces potential confusion if the nail is called out by diameter and length. 1. 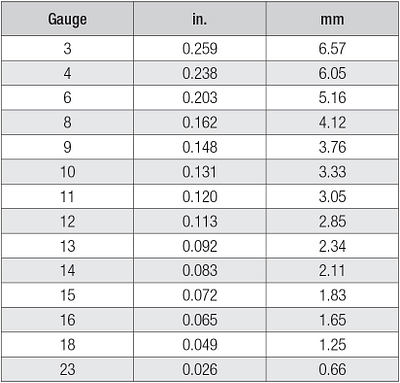 Table based on Birmingham or Stub's Iron Wire Gauge. Bright, coated, plain-shank nail or regular stock steel with flat round head and medium diamond point. Shank diameter is smaller than common nails of the same penny weight. A common term used for nails less than 1 1/4" in length with a head slightly larger than the shank. These nails can be easily concealed by countersinking below the work surface. A wire nail with a head that is only slightly larger head than a finish nail, often used for flooring. Bright plain-shank nail of regular stock steel with flat round head and medium diamond point. Shank diameter is larger than box nails of the same penny size. A wire nail with a concentric, full, round head and diamond point. The shank can be either deformed with annular rings or smooth. A wire nail with a head that is only slightly larger than the shank and medium diamond point. These nails can be easily concealed by countersinking below the work surface. A wire nail with a concentric, full, round head and 2.25 to 3 inches of shank length that is deformed with annular rings. The annular rings have over-shank diameter of 0.005 to 0.010 inch and the pitch is 20 rpi. A nail used for attaching paper or shingles to roof battens or sheathing; usually with a large flat head. A wire nail with a concentric, full, round head and at least 1.5 inches of shank length deformed with annular rings. The annular rings have overshank diameter of 0.005 to 0.012 inch and the pitch is 13 to 20 rpi. A wire nail with a shank that is typically 0.099" or less in diameter and a smaller head than other nails of the same size to help conceal the fastener after installation. There are no deformations on the shank, making nails with a smooth shank the easiest to drive. Smooth shank nails offer the least pull-out resistance when compared with spiral and ring shanks. A spiral "thread" on the shank causes the nail to spin during installation, creating a thread-like interlock with the wood, which increases withdrawal capacity. Spiral-shank nails are designed to drive easier into harder woods and dense materials while still providing increased withdrawal resistance. Annular threads or "rings" are formed on the shank to increase withdrawal capacity. The "rings" create an interlock between the shank of the nail and the wood, providing superior holding power. Generally considered the nail type with the best withdrawal resistance.